First published in 1982, Kerry Argent's One Woolly Wombat, is a classic Australian counting book, and has now been republished in a smaller format as a 'first reader'. Filled with Australian animals and themes, such as gum nut tea and Aussie Rules football, this is a charming book with a bouncy rhythm and lovely rhyme. From one woolly wombat lounging back in a stripy beach chair, all the way to fourteen slick seals heading off on a fishing trip, this is a fun book. I love that this book counts all the way up to fourteen. This is unusual in counting books. The illustrations are light and bright; employing a gentle humour young children will love. The Australian animals are full of character and with some of them spilling outside of their borders the playful energy shines through on every page. The words are entertaining and clever, with a smattering of alliteration. One Woolly Wombat is joyful to read aloud. Younger children can count the objects on each page and those a little older can easily memorise the lines of the story and use the book to start their reading journey. 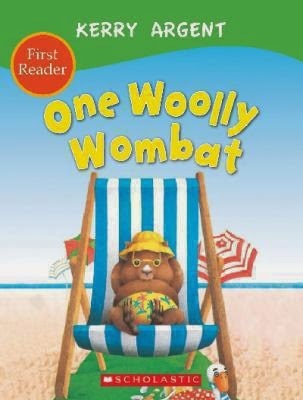 There are three other Woolly Wombat stories, all in the same 'first reader' format which make up a nice set for children wanting to read independently.